Crinoids are unusually beautiful and graceful members of the phylum Echinodermata. This is the phylum that brings you starfish, sea urchins, and sand dollars. The crinoids are a breed apart however, they resemble an underwater flower. Some even have parts that look and act like roots anchoring them to the ocean floor. They are commonly called sea lilies. Their graceful stalks can be meters long. Other varieties have no stalks or root like parts. They are commonly known as feather stars. 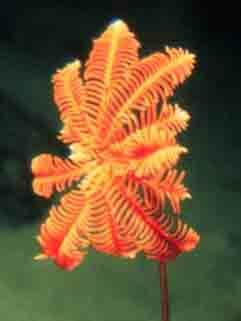 Unlike the sea lilies the feather stars can move about on tiny hook like structures called cirri. But wait it sounds like a description of living animals. I thought these pages were about fossils! Well right on both counts. Crinoids are alive and well and living in an ocean near you! They are also some of the oldest fossils on the planet. The earliest come from the Ordovician Period. At least the earliest that everyone agrees on. There is a class called Echmatocrinus that date back to the middle of the Cambrian Period but most paleontologists don’t count them to be true crinoids. Oh, to belong... Most of the Paleozoic forms died out in the great Permian extinctions. The few species surviving into the Mesozoic Era thrived. Many new species evolved during this time including the ancestors of the present day class Articulata. These echinoderms were at their height during the Paleozoic era. They could be found all over the world, creating forests on the floor of the shallow seas of this time period. There were so many in places, that thick limestone beds were formed almost entirely from their body parts piled on top of each other. Crinoids of today tend toward deeper waters. You won’t see them on your next snorkeling adventure. The stalked varieties are usually found in water over 200 meters deep, though some can be found 100 meters deep. The unstalked varieties, comatulids also live in deeper waters though generally not as deep as the sea lilies. So the really cool thing is that scientist can study living relatives of fossils that are 450 million years old. 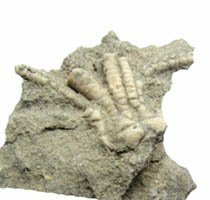 While these living crinoids are not the same species or orders as those of the past there are enough similarities to help us understand how these plant like animals lived. Crinoids fossilize readily and so there is an abundance of them to be found, mostly stalk fragments. There are 2 reasons for this. •	The ocean floor is a good environment for fossilization to occur. See fossil formation. •	Their skeletons are made of calcareous plates. This is a hard rock like material.